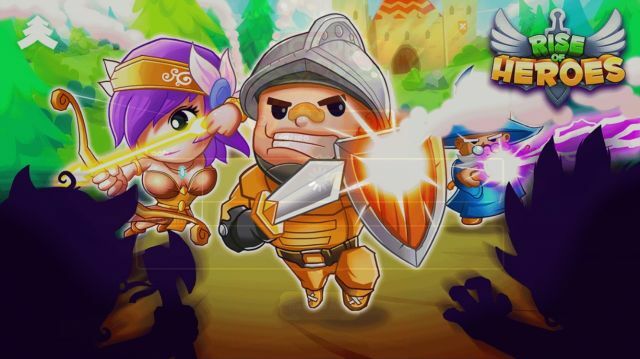 In their newest title, Pine Entertainment brings you Rise of Heroes- an animated RPG/Strategy adventure that puts players at the helm of an adorably cartoony army and tasks them with leveling up to make money, recruit new heroes and slay ferocious beasties. The game is free to play and is supplemented by a copious amount of in-app purchases, which are mostly aimed at getting around that whole irritating "wait to play" thing. The purchases themselves come in two different forms- Gems, which are used to buy better weapons or Packs, which contain a variety of nifty items including Arena Tickets, Gems, Weapons, or Armor depending on the pack you choose. The developers have done something neat with this though. There is an additional in-game currency- Emeralds- which are the only way to purchase the truly OP characters, but the catch to these precious stones is that they can only be earned through regular gameplay. The gameplay is reminiscent of Heroes Quest or Heroes Charge. The player assembles a party, levels them up, and then sets them against waves of heavily armed enemies. The outcome of the battles will depend on the optimal application of special items, power ups and potions as well as character placement, character weapons, and character level. These little tweaks make the game feel a bit more like a tower defense than your typical RPG and the automatic animations of the battles make the game perfect for the most casual of gamers. The game also does a decent job of letting players totally abuse their fictional online friendships by sending gifts of energy to be used in super tough event battles. The one thing that does drive me completely insane about this neat little game are the typos. The perfectionist writer in me wants nothing more than to proofread the entire script. The graphics are adorable and cartoony and exactly what you might expect. A few online communities have done a good job of keeping the developers informed of several game-ringing crashes and bugs and the game has already been updated a few times in the moth that it has been out on iOS with even more updates expected to follow. The music is a good, basic background tune and the sound effects are just your typical hack and slash style combat noises. Both of which are completely optional for those of you who prefer to play your mobile games in complete and total silence. Overall, if you are a fan of easy, bright, fun games that don't require too much thought, you'll love this game. If you are looking for a deeper experience, though, you may find this title lacking. We gave this game 4 stars for being well-executed, not a total knock off of things that we've already seen, but completely lacking a storyline and in desperate need of some editing. Listen! The end is nigh!! Hear my words ..